Chinese Immigrants to Canada Call for Beefed up Math/Science Curriculum in B.C. The Vancouver Sun reports that a group of Chinese-educated tutors are calling for British Columbia’s Education Ministry to raise math and science standards in the province’s public schools. The group of private tutors say that B.C. students are slipping compared to their Canadian counterparts and to students in other countries in international assessments of math and science aptitude, and this will harm the province’s children in the future unless there’s a change. For proof of a performance decline, the society points to the latest results from the Pan-Canadian Assessment Program, which tested the math skills of 32,000 Grade 8 students from across the country in 2010. While those in Quebec, Ontario and Alberta had results equal to or above the Canadian average, B.C. participants fell below. Students in East Asian countries, including China, have in recent years developed a reputation for excellence in science and mathematics. 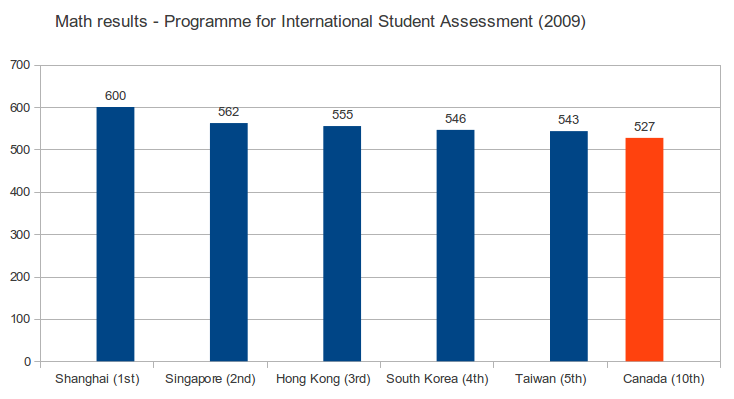 In the math portion of the recent Programme for International Student Assessment (PISA) for example, the top five performing jurisdictions were all East Asian, with Shanghai students topping the rankings. 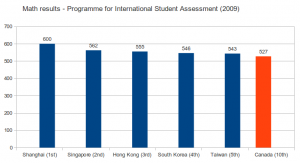 Chinese students have achieved these results despite the fact that education spending in China, at $1,593 US per pupil per year at Purchasing Power Parity (PPP), measures only a fraction of the OECD average of $9,860 (PPP). Given the apparently superior efficiency and performance of education in China, the tutors’ insights into their country of origin’s education system is being given consideration in Canada and attention from Canadian news media like the Vancouver Sun. It remains to be seen if Canada’s culture and education policy will transform in coming years as a growing immigrant population adds an international perspective to the way of doing things.